The rise and rise of online gambling has created something of a dilemma for those players who are right at home in the traditional land-based casinos. But when it comes to blackjack in Australia, taking the online route is not just a matter of convenience – it’s about going where the smart money is, and making sure you don’t get fleeced. Australian land-based casinos have deviated markedly from international blackjack norms in recent years, introducing a number of rules that swing the odds towards the house. From the deal of the cards, to the returns of blackjacks, and some very disturbing interpretations of what ’21’ actually means, the advantage is now firmly with the operators. European No Hole Card (ENHC) – Also called blackjack wins all, this is when the dealer claims all bets on the table after turning up a two-card 21 (assuming no player has a blackjack). This badly affects a player’s odds, as it ups the house edge by 0.11%. Original and Busted Bets Only (OBBO) – When the dealer has blackjack, busted hands, plus one bet from each split hand remaining is lost. If you have not split, you lose just the one bet are lost. This means it affects splits but not doubles. Busted Bets Plus One (BB+1) – When the dealer has blackjack, a player’s original bets are lost as well as an extra unit from any unbroken hands. This is unique to Australia and can affect doubles and splits. It is the most common rule applied. Original Bets Only (OBO) – When the dealer has blackjack, only the original, mandatory bet is lost. This is the most favourable for the player and effectively has the same house edge as American-style games (where the dealer has a hole card and peeks for blackjack). This rule is the best outcome for players of no hole card games, but because that is the case, it is rarely found in Australian casinos. One of the glaring abnormalities that has recently become standard practice in Australian land-based 21 games is the 6:5 payout for a player blackjack. This is considered a big no-no by many BJ experts, as the traditional payout for a natural hand is 3:2. The difference might seem negligible at first glance, but it adds up in the long run – which is always the key factor when it comes to casino games. For example: on a $10 bet, a 6:5 blackjack pays $12 as opposed to the $15 we would win with standard 3:2 odds. While it may seem trivial to squabble over the $3 the house saves on that one hand, imagine what that amounts to over the course of a day, a week, a month… However, odds aren’t the be all and end all when assessing the fairness of any given game, because the size of the returns alone can be deceiving, as you’ll see in the very next section. All 21s (non-blackjacks included) are paid out immediately, regardless of dealer’s hand. All five-card hands under 21 are paid out immediately. Players can double down on any hand of two or three cards. Dealer stands on a soft-17. Dealers no longer bust on hands of 22 in Blackjack Plus at Crown Casino. All those rules seem rather appealing, yes? True. But that is all irrelevant thanks to the one we have not yet mentioned, and can thus far go down in history as one of the worst blackjack rules (if you can call it that) ever introduced. In Blackjack Plus, the dealer does not bust with a hand of 22, but rather pushes with all bets on the table (i.e. any hand not already paid out). Yes, that’s right – in this version of 21, the house can have more than 21 points and still not lose. How Australia’s gaming regulators let this one slip through the net is beyond us. On its own, the dealer-push-on-22 rule bumps up the house edge by almost 7%, thus turning one of the most player-friendly casino games in to an absolute nightmare. Unfortunately, if you live in Melbourne or Perth and will not be tempted in to betting a minimum of $50 per hand, Blackjack Plus is just about your only option in brick-and-mortar (b&m) venues these days. The last decade has seen an explosion in Internet gambling, with gaming companies and punters alike realising the advantages of playing online. While racing, sports and poker sites take up much of the media coverage in Australia, casino favourites such as blackjack have grown just as significantly. And although many 21 players may find it difficult at first to comprehend giving up the tactile surrounds of the traditional table, the advantages to playing on the Web are manifold and manifest. In b&m casinos, decks are usually only shuffled once a certain amount of cards have been used. While this practice is often good news for card counters, it works against most players as more low-rank cards tend to come up. In contrast, almost all Internet games shuffle the deck after every hand. This means the full complement of cards is in play for each round, and so players who stick to standard optimal play strategies will generally see better results than in land-based casinos. You can learn more about card shuffling machines here. On a busy Saturday night, the blackjack tables at a b&m establishment can get pretty crowded – it is Australia’s most popular casino game, after all. This is especially true of the low-bet games, which are often overrun with tourists, novices and loud-mouthed inebriates with more dollars than sense. Even if you get a seat and don’t have to resort to back betting, games can be slow and the potential for mishaps is obvious. All it takes is a spilt drink and some idiot saying the wrong thing to a fellow player – or worse yet, the dealer – to bring the game to a grinding halt. None of that is an issue with online blackjack. You don’t have to put up with the throngs and the morons, and there is no need to tread lightly on matters of etiquette. If the red mist happens to descend and you spray a few choice words at the computer screen, nobody will come into your living room and haul you out by the arms. Best of all is the speed of play. Most blackjack sites offer one-v-one games, where it is just you against the dealer – so you can play more hands in less time than it would usually take in a b&m casino. 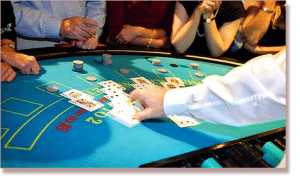 When you walk into Crown, or Star City, or any land-based casino, you will not find any tables set up for players who wish to brush up on a few rules or tighten up their strategy before hitting the real money games. The last thing such a venue wants is for the punters to actually know what they are doing. However, many online casinos offer free games and practice-play blackjack varieties, thus allowing you to try it out for zero cost until you feel comfortable putting up your hard-earned cash and playing for keeps. As we demonstrated earlier, the blackjack options in physical casinos nowadays are extremely limited and weighted heavily towards the house. More often than not, you will be stuck with a set of rules you don’t really fancy and a bunch of odds that will rarely work in your favour. When you play online, however, the world is your oyster. Players can choose from every fathomable variation, from European blackjack, to Vegas-style games, Spanish 21, all different kinds of Pontoon, and a host of multi-hand games, progressive jackpots, and daily online tournaments. You’ll also have access to more lenient table limits. So if you believe in freedom of choice and will not simply settle for the house standard, open up an account at one of our recommended, fully secure online casinos and start winning real money today. For further information about the additional benefits of playing 21 on the Internet, we have another dedicated article about the advantages of online blackjack.